Naval ships from India, Australia, Japan, Singapore, and the United States during the 2007 Malabar Exercises. Australia is keen to join India, the United States and Japan in joint naval exercises in the Indian Ocean amid China’s growing influence in the region, the country’s defense minister Kevin Andrews said Thursday. Australia was initially included along with Japan in the 2007 expanded edition of Exercise MALABAR – originally a U.S.-India bilateral exercise – prompting China to lash out at the so-called quadrilateral security dialogue or ‘quad’ designed to contain it (See: “India, Japan and Australia: A Trilateral in the Making?”). That had led to concerns in several capitals including Canberra that such arrangements may be too provocative. But Andrews, who was on a trip to India this week, told an audience during a question and answer session in New Delhi that it was “a mistake” for the then-Labor government under Kevin Rudd to pull out of the so-called quadrilateral defense dialogue and naval drill. The withdrawal, which occurred following a meeting between then foreign minister Stephen Smith and his Chinese counterpart Yang Jiechi in February 2008, was read by some as an attempt by the Rudd government to curry favor with Beijing. Andrews said the current Australian government would accept an invitation if it was invited by India to observe or participate in such an exercise. According to the newspaper, a spokesman for Andrews also said that quadrilateral exercises were later discussed in a meeting between him and his Indian counterpart Manohar Parrikar. Andrews’ remarks come amid growing attention to and interest in the expansion of such exercises, particularly in the wake of China’s growing assertiveness in the region. Japan is set to join the United States and India in this year’s iteration of the Malabar exercises (See: “Japan to Join US, India in Military Exercises This Year”). 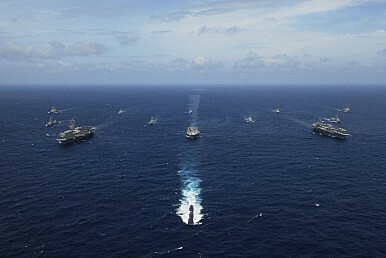 And even though Australia will reportedly be left out this year, former and current U.S. officials have been reiterating their desire for the permanent expansion of the Malabar exercises to include other partners as well such as Canberra (See: “US Official Calls for Permanent Expansion of Malabar Exercises with India”). Further initiatives have also been discussed between India, Japan and Australia as part of an ongoing trilateral dialogue between the Asia-Pacific powers. Australia and India will also hold their first ever bilateral naval exercises next month (See: “Australia, India to Hold First Ever Naval Exercise Amid China Concerns”). Andrews said he expected defense ties to deepen even further in this dimension over the next few years. “Gradually we will expand the range of exercises. We are looking at air force to air force and army to army exercises over the next year or two,” he said.